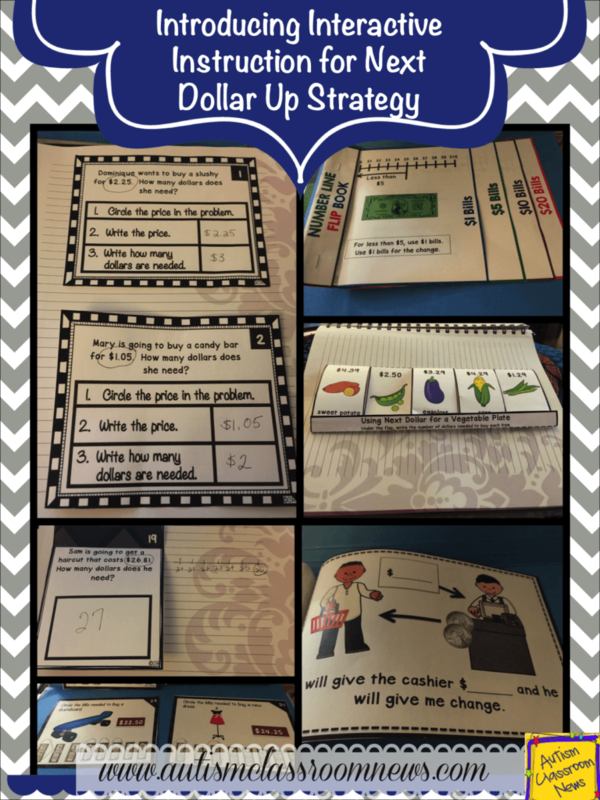 Next dollar up is a great strategy to use in life skills and elementary special education classes. I love to use it to teach students who have difficulty making change. 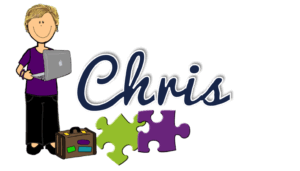 I want to share some ideas and resources that instruct it. What is Next Dollar Up? For students who aren’t able to make change, either because they haven’t mastered it or they haven’t been taught yet, Next Dollar Up or Next Dollar, or One Dollar Up, is a strategy for them to be able to make purchases and know if they have enough money to make a purchase. Think about a student who thinks that their $10 allowance is enough to buy a new Wii. Um, no. Think about another student who goes to buy something and doesn’t have enough money to make the purchase–this can lead to frustration (for both the buyer and the seller–and possibly those in line), tears and challenging behavior in some situations. 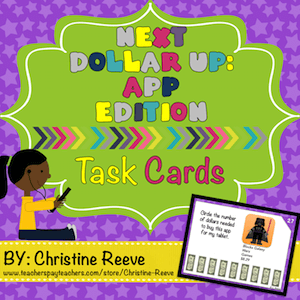 Next Dollar Up teaches the student to find the number of dollars in the price and give “one more dollar for change.” This way they learn to determine if they have enough money and to make purchases. Often we think about teaching next dollar up with single dollars, but I started thinking about it and realized we also needed to be teaching it with other bills…and teaching students to wait for their change. In addition, although I have a number of activities focused in using this strategy, I really hadn’t found any about how to TEACH the skill–just to practice it. So, this product is specifically designed to provide you with the tools to teach the skill from scratch. The only prerequisite is that students can identify specific bills and have 1-1 correspondence so they can count out the dollars. I’ve included two teaching programs (with data sheets embedded) that provide the steps for teaching the skill in a systematic way. I also included some more detailed instruction in addition to the teaching program steps to provide information about what materials will be needed to be prepped for each step. So for step 1, I give you which mini-books, flip flaps and task cards need to be prepped before presenting the lesson. I also made 5 mini-books that are designed to present the skills to the students so that they understand how it works. 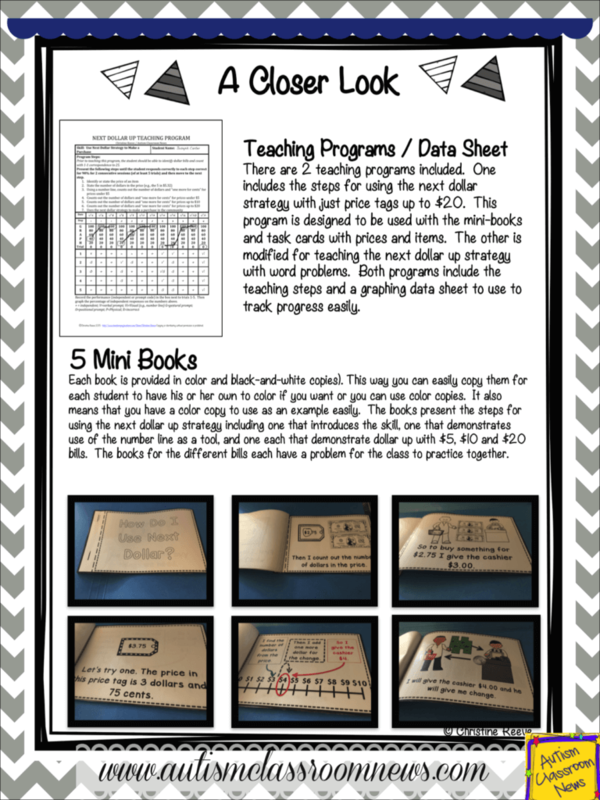 The teaching strategy uses a number line to figure out the next dollar up and it is introduced in the mini-books as well as in a flip book for reference. I also created a flip book that shows common equivalents of bills. For example, a $5 is the same as five $1 bills. A $20 bills is the same as two $10 bills. The flip books can be used for the students to refer back to. 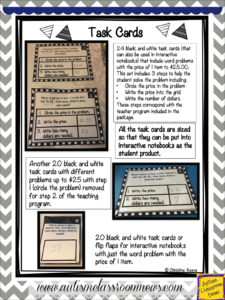 I included black and white as well as color so that you can have a color master and the students can each have his/her own black and white copy–or you can use them how it makes sense for your class. 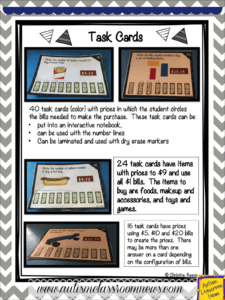 I created lots of task cards for practicing skills that match the teaching program steps. 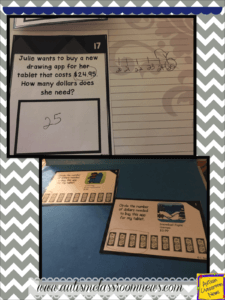 For example, one of the teaching programs teaches using next dollar with word problems (in an attempt to help match some of the access points / standards for math). The task cards start 3 steps–circling the price, writing the price and finding the next dollar. Then fades the circling the price step and then fades step 2 (writing the price) as well. I also created some matchbook flip flaps. 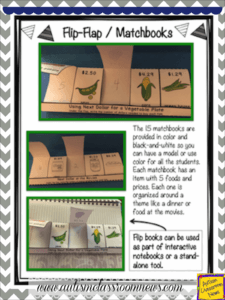 These can be used as part of interactive notebooks, lapbooks or independently. I thought they would provide a little different way for students to interact with the concept and demonstrate skills on a permanent product. All of the flip-flaps focus on food items (e.g., meals) because they are so often reinforcing for students. I am really excited about the fact that all of these materials could be used to develop interactive notebooks for students about the next dollar. 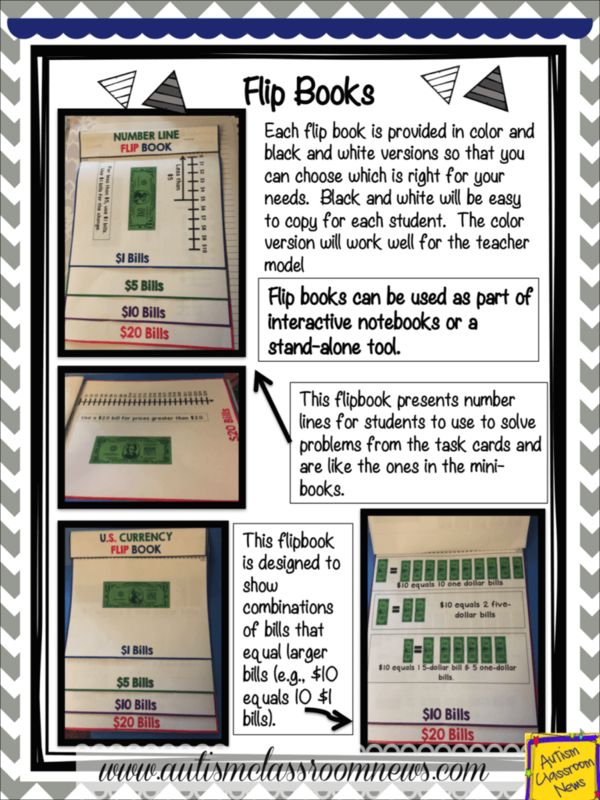 All of the materials from the flip books to the task cards can be easily pasted into books and I’ve tried to give some guidance about how they can be used in the instructions. And finally there are 12 bonus next dollar task cards that are a sneak peak of an upcoming product practicing next dollar skills (and probably another practicing money skills in general) to buy computer equipment and apps for tablets and smart phones. Folks on Facebook have indicated this is something that would be really motivating for their students so hopefully I’ll have those up in the next few weeks. So, have questions about this set of materials? Leave me a comment and I’ll be happy to answer them. Have feedback about them or something you would like to see in addition? Leave me a comment below about that too–or message me on Facebook. If you are interested in checking this out, you can find it by clicking any of the pictures in this post.